New York : Scholastic, , c2008. 65 p. : ill., map ; 20 cm. Kristy and Rachel hope they have the right moves to get Gemma the gymnastics fairy&apos;s magic hoop back from Jack Frost, but the goblins soon interfere with their plans. 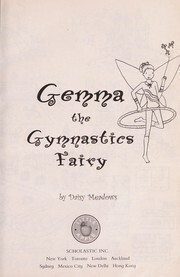 Gemma the gymnastics fairy / by Daisy Meadows. Frost, Jack (Fictitious character)--Juvenile fiction. 100 Personl Name ME 1 $a Personal name Meadows, Daisy. $c Statement of responsibility by Daisy Meadows. $c Date of publication, dist, etc , c2008. 520 Summary Etc. $a Summary, etc. note Kristy and Rachel hope they have the right moves to get Gemma the gymnastics fairy&apos;s magic hoop back from Jack Frost, but the goblins soon interfere with their plans. 650 Subj:Topic 1 $a Source other than LC Fantasy. 650 Subj:Topic 7 $a Source other than LC Fantasy fiction. 655 7 $a Fantasy fiction. 800 SAE:PersonlName 1 $a Personal name Meadows, Daisy. $t Title of a work Rainbow magic. 830 SAE:UnifrmTitle 0 $a Uniform title Little apple.